MyConferenceSuite, from D. E. Systems has introduced its new HTML based interactive floor plan feature for exhibitor registration pages. 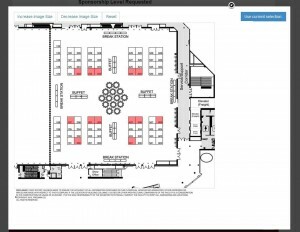 The feature, allows event organizers to have their exhibit floor plan map uploaded directly into the registration pages. The map is interactive, allowing registrants to view via mouse over, who is registered where, and allows them to select the booth they wish with the click of their mouse. Some of the key advantages of this type of system are that it eliminates a lot of the questions potential exhibitors may have and provides them with clarity about their booth space, where it is located and how the event is laid out. In the past, exhibitor registrants would view static exhibit floor plans. This dynamic HTML based interactive floor plan allows them to view the map, see who is where then select the booth of their choice.